Begin by cleaning the mushrooms. Brush off any dark specks and slice. This is where Harry really excels. He’s the best prep cook around! 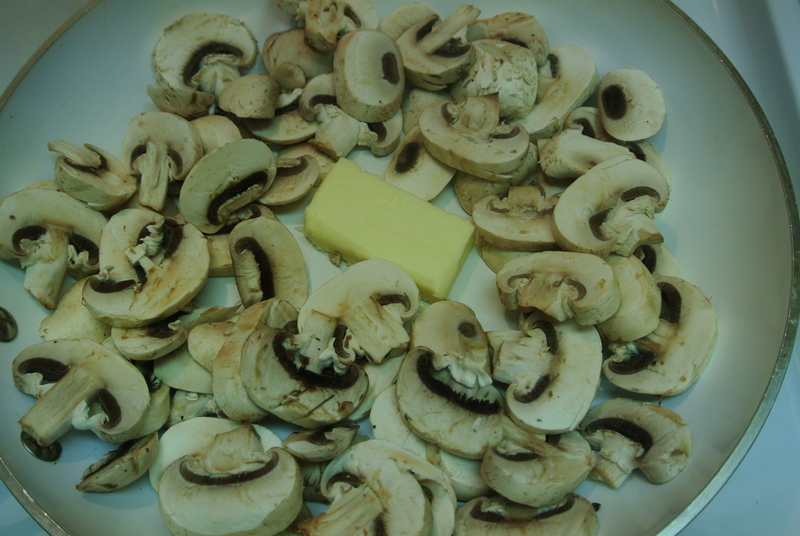 Add the first 2 tablespoons of butter to the pan, melt it and add the sliced mushrooms. The secret to good fried mushrooms is to coat them in the melted butter and fry them on high heat so they don’t loose all their moisture. Never salt them at this point. It also brings out the moisture and you’ll be boiling mushrooms not frying them. Try not to stir the mushrooms much as this will make them watery too. Yes, its hard to let something cook on high heat for fear of burning, but a decent fried mushroom will thank you for letting it do all the hard work over the heat. You want them to be golden brown when done. 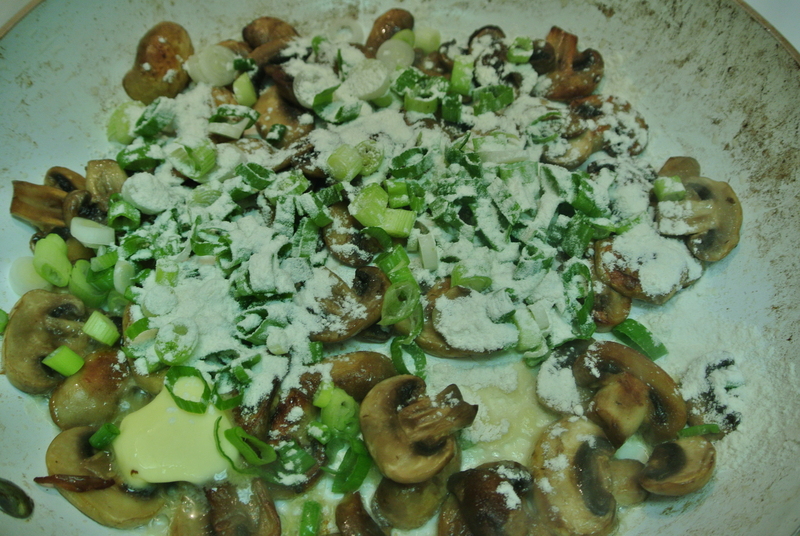 Now its time to add the scallions, the additional tablespoon of butter, and the flour. Stir it over medium heat until you can’t see raw flour. Then pour the milk over the mixture and boil it until the sauce thickens. This will take about 2-3 minutes. Then add the salt and pepper. 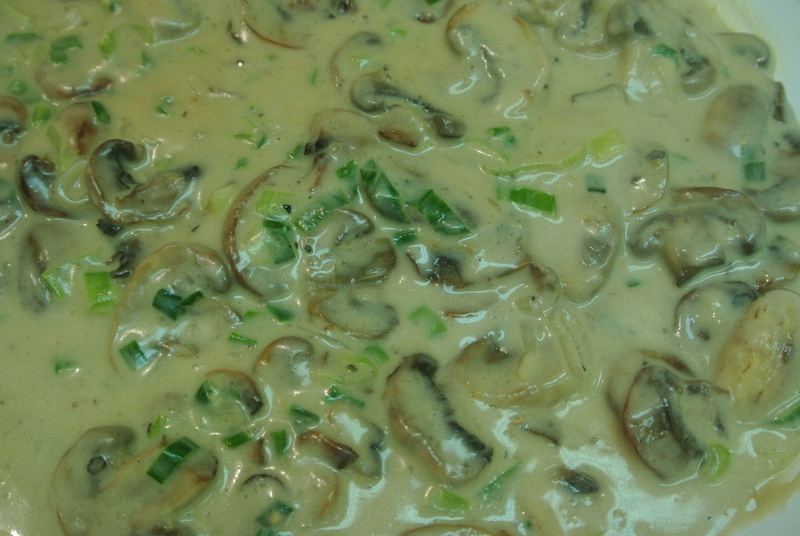 The sauce becomes thick when it reaches the consistency of a cream sauce. Next heat the oven to 350 degrees F. and slice the croissants horizontally. Layer the ham and cheese on the open face of the croissant. Divide the hot mushroom mixture over the meat and cheese. Place the top of the croissant on the sandwich and heat for about 10 minutes. The cheese should melt and the top of the sandwich should be a deep golden brown. 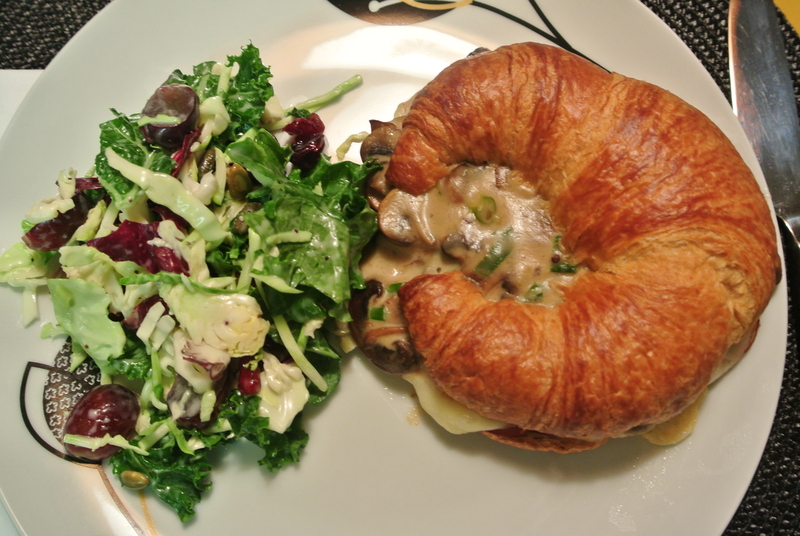 Serve with a side salad and Voila! A dish fit for company but easy enough to make at the end of a busy day. Cook’s tip: Buying sliced mushrooms makes it even quicker to prepare the sauce. Bagged salad with some seasonal fruit and crumbled cheese adds interest to humble greens. If you like this recipe please be sure to share it with your own Facebook and twitter friends. We love to know how your enjoyed the foods that we love so please leave us a comment below. This entry was posted in Brunch, Dinner, Lunch, Sandwiches, Uncategorized and tagged Croissants, Ham and cheese croissants, light supper, lunch sandwich, sandwiches. Bookmark the permalink.